“You’re having strangers stay at your house?” asked my friend tentatively. I didn’t think it was weird, and I wasn’t worried, despite the fact that our only exchanges with this couple had happened on Facebook. 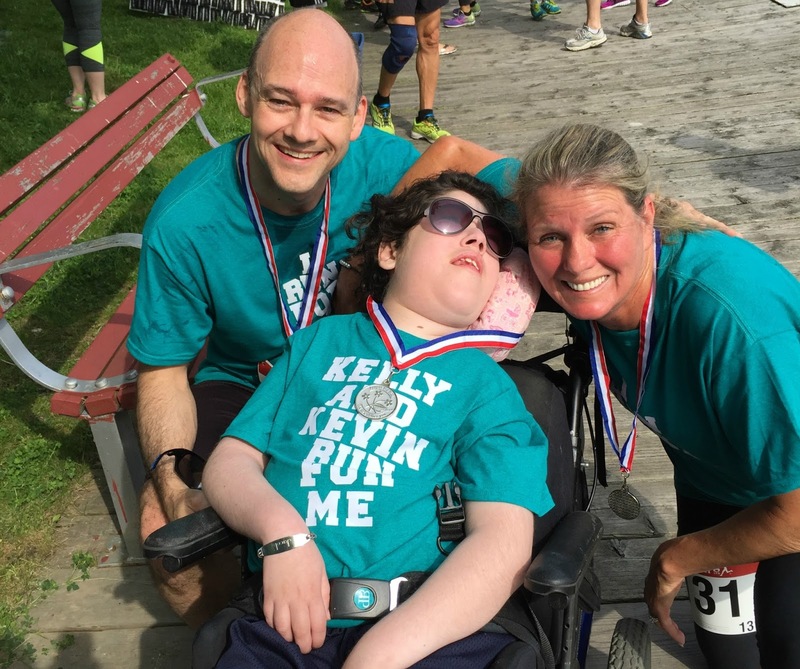 Kelly and her fiancé Kevin were part of Who I Run For, a Facebook group that pairs children and adults with disabilities with athletes to create a mutual support system. The athletes and their training and events provide excitement for those who can’t be as active, and the buddies with disabilities provide a new kind of purpose and motivation that power the athletes’ workouts. My 14-year-old son Jacob was matched with Kelly, who lives in New Hampshire, in 2014. From the day they were matched, Kelly posted messages to Jake about her running adventures. She almost always included photos from her runs and it became clear that Kelly had recruited her fiancé, Kevin, and her son, Nick, to run for my son as well. Together they formed Team Jake. As time passed, our family got to know Kelly and her family. We saw photos of them holding homemade signs that read We Run 4 Jake along the routes of their runs and we shared Kelly’s stress around the wedding plans, including the last minute aggravation with her wedding gown! Team Jake came into our lives around the time that Jacob’s health started to deteriorate. We didn’t know Kelly during the 12 years that Jacob’s health was stable and he was able to ski, attend sleep-away camp and be a full-time student. She wasn’t around when we fought, successfully, to have Jake attend a regular school and she missed the time Jake was invited to listen to his favourite singer, Andrea Bocelli, rehearse before a concert. We were matched shortly before Jake spent almost a year living in the hospital. Kelly was in our lives when Jake was rushed to the hospital and spent weeks in the intensive care unit, hooked up to machines helping him breathe. She was around when he celebrated his Bar Mitzvah as an inpatient. Kelly and her crew stayed abreast of Jacob’s challenges and frequently sent notes of support and upbeat messages to us. She also sent Jake medals from races and t-shirts and other running paraphernalia that she, Kevin and Nick collected. One cold Sunday morning, when my husband, Andrew, Jake and I were having our weekly coffee at Starbucks, my phone alerted me to a message from Kelly with the most exciting and unexpected news: she and Kevin were coming to meet Jake on their honeymoon. They planned their post-wedding week so that they would arrive in Toronto on a Friday and we invited them to stay with us for the weekend. How perfect would it be if the newlyweds and Jake could run a race together? It didn’t take us long to find a race that coincided with Kelly’s and Kevin’s visit. After a brief discussion with the race director, Kelly informed me that everything was set—they would run the race with their buddy and push him across the finish line. It all sounded great in theory, but would Jake be healthy enough for the 30-minute drive to the race? The run was scheduled to begin at 9 a.m., but my son hadn’t been out of bed before 11 in over a year. That’s because it takes a long time to clear his airway so that he can sit up in his chair without struggling to breathe. And just two weeks earlier Jake was so ill that he narrowly avoided an ICU admission. But Jake being Jake, and one to never miss a party (except for his 14th birthday when he was so sick he slept for almost five days) or a chance to be surrounded by friends, we had to try. So we crossed our fingers and made the plans. I was only a little surprised when I went into his room at 7 a.m. on race day and saw a pair of large green eyes, fully awake, ready for his latest adventure. He was excited and blinked his eyes to confirm that he was ready to run with Team Jake! Dressed in a teal blue t-shirt that read Kelly And Kevin Run For Me, my son fit perfectly between his runners, who were wearing the same shirts with the banner I Run For Jake. As they crossed the finish line, the trio gladly accepted their medals and posed for photos. Marcy White is the author of The Boy Who Can: The Jacob Trossman Story. You can follow her on her blog at Cure PMD. Marcy is a family leader at Holland Bloorview.